Every once in a while I have a day when I hate that I'm a blogger. But seriously. Cutest shop ever. Cutest dresses ever. I don't really know what else to say. Except that one of you will be shopping there for free very soon! :o) Yay!! Normally to enter a giveaway I just ask that you leave a comment, but the dear folks at Shabby Apple do request that you "like" them on Facebook and share which SA dress/item is your favorite in your comment. (Well worth it for $100, I'd say!) The giveaway is open to US residents only. So go check them out and leave a comment on this post with your favorite dress and your contact info (email) and we'll announce the winner next Monday, Aug 20th. And even if you're not the winner, enjoy a 10% off discount online when you enter the code: rufflesandstuff10off! And have a great day. I'll be back soon to share some of the photos from the ladies' retreat I enjoyed this weekend. I had an awesome time! So beautiful up there. thanks for the giveaway! I love the continental cocktail dress, it's so pretty! The Blue Eyes dress is absolutely adorable. Thank you for the wonderful giveaway!! I like Shabby Apple on Facebook! That red dress is calling my name! I like Shabby Apple on FB. I love their shoes. Right now my favorite are the "Glowing" flats. I like them on FB. I love their Cockeyed Optimist dress for now! The color suits my skin tone and the cut looks like it'll suit my shape. Thanks for the giveaway! Carnival just the right length to hide my upper arms and perfect skirt length. OH My! How I'd love to have a Shabby Apple dress. Our family pictures are coming up and Baby would be PERFECT for them! Thank you!! I like them on FB. So many to pick from - right now I'd say Baciami from the Roamin' Holiday collection. Thanks for sharing! I'm interested in their blue eye dress. Even though I'm not sure if the fit would fit me nicely but I like the style. SA has some pretty nice lace dress too -- so many choices. Thanks for sharing this giveaway and I already like them on FB! I'm rather into shirt dresses right now so I would probably go with the A+ or Ivy League dress. Though I am going to keep my eye on the red Streetcar skirt! I like the Dreamer grey boots, but there is tons of great stuff on there. I love the Red Fox :)It is beautiful!!! LIked facebook page! I love almost all of their dresses, but I'd have to choose the "Carnival" dress! I liked Shabby Apple on FB! So many great items, but one that really stood out to me was the Jitterbug dress. The 'One For My Baby' dress is definitely my favourite. I don't think I could ask for anything else; Tiffany blue, pleats, polka dots, Peter Pan collar... I think I just might be in love! I am loving the CEO and the VP! Ahhh! Yes! I like them on Facebook and I like the dress "Aintree". So many beautiful dresses to choose from! I like them on FB already. I love the Finding Out dress! I may need it soon! I love the whole Lighthouse collection especially the Vineyard Sound dress! I'm leaning towards Elizabeth Islands maxi dress. I love love love Shabby Apple. Have for years. I would love a chance to win. I love the Sicily maternity dress! I only have one maternity dress right now, so another one would be great! Thank you for the chance to win! The bellimisa dress is so cute! Liked them on FB. I love the Champs Elysees dress- so gorgeous! Great giveaway! I think I'd want pretty much anything in the Academia section -- too perfect for my new teaching job! My favorite is A+ or Ph.D (in navy). I like Shabby Apple on Facebook! :) They have the cutest clothes! My favorite Shabby Apple dress (currently) is the New Caledonia dress! Thanks for the giveaway! :) I heart your blog! Oh oh oh! I love the G. Cooper number. Pinstripes, gray, and a full skirt? Sold! i really like the 16 candles dress! the mariposa grove is also great....how can a girl just choose 1? I am in LOVE with the Overboard dress in the Set Sail Collection! I've been wanting it all summer! What a great giveaway! Thanks for the give away. LOVE the Desert Modern dress. Thanks for doing the giveaway! I follow SA and my favorite (one of my favorites) is the Pina Colada dress! Summer Wind or Racquet Club. I like Shabby Apple on Facebook! Spanish steps dress is so feminie and pretty! mrshwang012(at)gmail. Thanks! I like Shabby Apple on Facebook! My 2 top favorites are the Primavera and I'm Late I'm Late dresses! Thanks for the giveaway, one of my favorite dresses is Hollywood Hills. I already "like" Shabby Apple. Crossing my fingers and toes for this one! I like them on fbook, and my favourite dress is the "A+", so cute, comfy and casual! I like them on fbook, my fav dress is the "A+" and "Beachcomber", so cute! ooo I've 'liked' shabby on facebook for awhile now:) My favorites change all the time but right now I'm loving the 'alice' dress from the mad hatter collection-so dainty and feminine! Liked them on fb! My favorite dress is Serenade - lovely! My favorite is Highland light! love it! Thanks for the giveaway! I like Shabby Apple on Facebook . I love the Alice dress, I just their clothes! i love shabby apple! already liked them on fb. my favorite dress is probably tea time. I really love the "One for my Baby" dress or "Blue Eyes"...oh, so cute!! Now to like them on FB so I can be entered! :D Thank you for hosting this giveaway! I love the Neapolitan dress! I am 32 weeks pregnant. I would love to wear this one to a wedding next month. I've liked Shabby Apple on FB for a while! I love the Serenade dress. Thanks for the giveaway! I love the entire lighthouse collection! But especially the Race Point Skirt! I already like them on FB (I enter every Shabby Apple post that pops up in my Bloglovin'!) and I'm in love with the entire Lighthouse collection. I'd have a hard time deciding what to get! I liked them on fb, and I really really love the cocoa bean dress! Thanks for the chance! i really like the yellow Bellissima dress!! It helps that i'm a sucker for that shade of yellow! i love the bette d. dress in black! I like them on FB. They have so many beautiful clothes! Liked on FB. I love the Consultant dress! I like them on Facebook. I love th one for my baby dress! 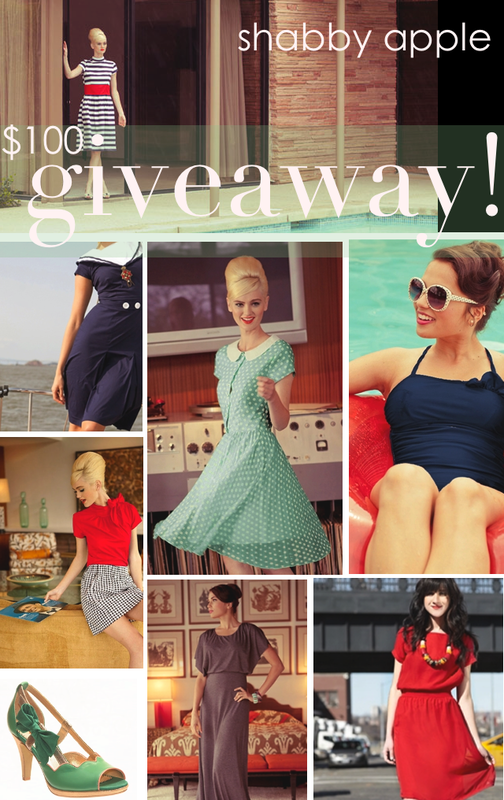 I don't use facebook....great giveaway though and so many great clothes to choose from! It might be hard to decide! The Maxi skirts catch my eye! beautiful! My favorite right now is the Blue Eyes dress. I think it's really cute! I had already liked them on Facebook also. I liked them on Facebook, and the Bon Voyage dress was seriously made for me :) Thanks for the chance to win! I like Shabby Apple on fb and love the Alice dress! So many great items! Thanks for the chance to win! I'm a FB fan and I LOVE the Bon Voyage dress! Thanks for the killer giveaway. I liked them on fb and my favorite is... wow, there were so many! Maybe the Nantucket dress? I have so many of their dresses pinned on pinterest! It's hard to say but I love their pina colada dress in yellow and their consultant dress right now! Excited to see their new zoology collection. erinladybug at yahoo dot com Thanks! I like Shabby Apple on FB. It's so hard to choose a favorite---I can't in fact. I'll just say that I love Heart of Me. I am loving the Anchors Away dress! I have already "Liked" them on Facebook! I liked them on Facebook. I can't believe I hadn't done that before now! I've been eyeballing their "I'm Late! I'm Late!" dress for what feels like a year now! I also like how they have a listing for "Maternity Friendly" listing on their site. Great for ladies like me who want pretty new clothes, but are hoping to get pregnant soon! I love the Anchors Away dress! Thanks for a chance to win! Liked them on Facebook! I LOVE their swimwear and have been eyeing the Cabana in pink all Summer! My email address is mmgoliday@gmail.com. I like Shabby Apple's facebook page, and I adore the Rhapsody dress (in the green AND the blue!). So lovely! I like the Elizabeth Islands Wrap Maxi Dress, the Gold Bangle Bracelet Set, & the Coolio flats in Canary. I've liked Shabby Apple on FB. Thanks for the giveaway & for the 10% discount. I've been a Shappy Apple fan on FB for a long time. I think my favorite is either Golden Afternoon or Alice! They are gorgeous! I like Shabby Apple of Facebook. My favorite is the Spanish Steps Dress. So pretty! I love Shabby Apple! Thanks for the giveaway. I like the block party dress. I already like them on FB :) It's so hard to pick just one fave, but I'll go with Garden Isle...it's beautiful! i like shabby apple on facebook. my fav item right now is the conversation heart necklace. I liked Shabby Apple on FB. I love the I'm Late, I'm Late dress in the Mad Hatter collection. So classic! I already like them on facebook and am in LOVE with the grey wrap maxi dress!! Soooo beautiful. Like! And I LOVE the overboard dress! I already "like" them on facebook- and I'm digging the Hyannis skirt right now! "liked" on fb & I'm crazy about the red headliner dress! Thanks for such a great giveaway! My favorite is the Blue Eyes Dress!!! their blue eye dress is my fav! but I really just love them all! I am in love with a che bella dress. Thanks for great giveaway!!! I have "liked" shabby apple on facebook for over a year now! I love their dresses and wanted to order the Alice dress for my sister's wedding but then they sold out of my size! My favorite dress, however, is the Cider dress. I love orange and it is hard to find dresses in that color! Thank you for this chance to win!!! I made sure to like 'em on facebook. I like them on FB! I love the One For My Baby dress, but there are so many great ones! Love everything! I would enjoy the Overboard dress -- so cute! I liked shabby apple on facebook. Love the Beachcomber dress! love the Alice & Im late, Im late dress! liked them on fb. I simply love the Alice dress!I always get so sucked in to their site, there are so many beautiful things! I really like the golden afternoon dress! Pink plus scallops? yessssss! My birthday is August 20th so it would awesome to win this ;) lindsaybong(at) gmail (dot) com. I really love the freshman year skirt! Elizabeth Islands Dress looks like it would work nice as a nursing mother. I finally narrowed it down to the Happy Talk dress and the Preppy Lady shoes (either color b/c they are both amazing!. I know you said to comment on your favorite "dress" but I just couldn't leave those shoes out! So hard to pick one, but Scarlett Raven certainly caught my eye! LOVE anything from the mad hatter collection! I LOVE SA!! My favorite dress is the 5th Avenue--it's an older one that I've been dying to have since I first saw it, like, 3 years ago, but I've never been able to justify the expense! Of course I like them on FB! I regularly look at their website and I don't know if I could ever pick one dress that I like the most... Thanks for the giveaway! UM HOW BEAUTIFUL IS THE CHAMPS ELYSEES DRESS!! I could wear that everyday this summer. I like Shabby Apple on FB, and I like 'After Class'. I like Shabby Apple on FB and I like the Espina Bonita dress and the Bon Voyage dress! Both look very flattering. like! I like the preppy lady heels! I like shabby apple of FB and the beachcomber dress is perfect! The Mad Hatter collection is all kinds of amazing - especially the Tea Time dress! And, yes - I'm a Facebook fan! One of my favorite dresses from Shabby Apple is the "One for my Baby" in that beautiful light green! Ooooh! I love them on facebook and I like the beauty mark dress. It's a toss up, I can't decide, but I love quite a few of the dresses from the Roamin Holiday collection! Liked them on facebook! I like Shabby Apple on facebook, and I can't decide between the Maccu Picchu and the Seven Seas in Seersucker. can i pick two? i love the confidential and the off-campus dresses equally. I like them on facebook and my favorite dress is the Bali Ha'i. I like Shabby Apple on Facebook, and I love the Gray Fox dress. I like Shabby Apple on Facebook, and I LOVE the Serenade dress! So gorgeous in every color!! great giveaway! i like on fb and love the cider dress! I like them on FB already and two of my favorite items are the dresses the Ramble and Red Fox. I like Shabby Apple on Facbook and love their dresses! My favorite is the El Capitan dress!! I like Shabby Apple on facebook! My favorite dress is Bernini! I've always loved their Walk the Plank dress. Such a great color combination! Such cute dresses, hard to choose one as a favorite, but I really liked G. Cooper. I love R & S even more. Thanks for all your hard work! I really love the Serenade dress and the Elizabeth islands dress or the bandersnatch skirt. So beautiful! My favorite dress is the Elizabeth Islands long grey dress. Lovely! I love this giveaway and Shabby Apple (I liked them on Facebook)! All the different styles SA has are just classic. My favorite dress has to be the Rhapsody (https://www.shabbyapple.com/p-1567-rhapsody.aspx). It just looks so flattering and comfortable! I will offically be a mommy in 2 weeks (or whenever my little one decides to make her appearance) so it would be fun to get a new beautiful dress for when I get back in my pre-baby shape! My favorite dress is Racquet Club. The Pina Colada dress is definitely a favorite of mine. I'm a fan of SA! Love the Forbidden City dress. It's so cute! I love shabby apple. It's so hard to pick a favorite! I really like their South Pacific line, specifically the Sacred Falls dress. And I liked them on facebook. celestepittman(at)gmail(dot)com. Thanks, Disney! I like Shabby Apple on FB. I love the Desert Modern and the Che Bella! dresses.